This species is accepted, and its native range is S. Tanzania to S. Malawi. Evergreen tree up to 27 m. tall; young branches softly and ferruginously stellate-tomentose, soon glabrescent; bark ashy-grey. Leaf-lamina up to 22 × 9·5 cm., coriaceous or subcoriaceous, obovate-elliptic to obovate, apex abruptly acuminate, margin entire or sinuate, base broadly cuneate or narrowly rounded, glabrous on both surfaces except when very young, midrib prominent on both surfaces, nerves in 12–15 pairs, slightly prominent above, very prominent beneath, venation reticulate, prominent beneath; petiole up to 6 cm. long, softly tomentellous but soon glabrescent, with a persistently puberulous pulvinus; stipules up to 7 mm. long, caducous, linear-lanceolate, ferruginously tomentose. Flowers in few- to many-flowered fascicles on the 1–3-year-old wood. Female flowers as in the male but with 4 stellate-tomentose, 2-ovulate carpels; style 1 mm. long, stellate-tomentose; stigmas 1 × 0·75 mm., patent, papillose; anthers 6–7, sessile, surrounding the base of the carpels. Male flowers ferruginously tomentose; pedicels c. 1 cm. long, not articulated; calyx campanulaterotate, deeply 5–6-lobed, densely light-brown-pubescent or -tomentose outside; tube glabrous within, 1·5 mm. long; lobes 3·5–6 × 2·5–3 mm., narrowly ovate, apex acute, with 3 longitudinal nerves, densely stellate-pubescent in the upper half within, with minute globose papillae below; androphore c. 3 mm. long, densely stellate-pubescent to near the apex, crowned by a uniseriate ring of 5–6 anthers; vestigial carpels 4, immersed in the top. Male flowers ferruginously tomentose; pedicels c. 1 cm. long, not articulated; calyx campanulaterotate, deeply 5–6-lobed, densely light-brown-pubescent or -tomentose outside; tube glabrous within, 1·5 mm. long; lobes 3·5–6 × 2·5–3 mm., narrowly ovate, apex acute, with 3 longitudinal nerves, densely stellate-pubescent in the upper half within, with minute globose papillae below; androphore c. 3 mm. long, densely stellate-pubescent to near the apex, crowned by a uniseriate ring of 5–6 anthers; vestigial carpels 4, immersed in the top. Female flowers as in the male but with 4 stellate-tomentose, 2-ovulate carpels; style 1 mm. long, stellate-tomentose; stigmas 1 × 0·75 mm., patent, papillose; anthers 6–7, sessile, surrounding the base of the carpels. Follicles 1–2, 1·3–1·4 × 1·3–1·7 cm., sessile or subsessile, fubglobose, apex rounded or bluntly mucronate, slightly narrowed at the base, serruginously stellate-tomentose, 1–2-seeded. Seeds ellipsoid, c. 1·2 × 0·9 cm. ; testa brown, rugulose. Evergreen tree, (3–)18–35 m tall. Cola mossambicensis is listed as VU B1+2C, i.e. vulnerable, (www.redlist.org), based on an assessment by S. Bandeira in 1988 (Bandeira, S. 1995. Data collection forms for tree species of Mozambique). Bandeira noted that this species is severely threatened by the decline in quality and conversion of its habitat for agricultural purposes. However he cited the species as mainly occurring in central Mozambique, and only possibly occurring in Malawi. In fact, of the 17 specimens known, most are from Malawi, where it occurs in Mlanje, Dedze, Ncheu and Zomba Districts, seven of the specimens occurring in Zomba District. Six specimens are known from Mozambique, namely from Manica e Sofala, Zambezia and Zambezia-Niassa Provinces. Since the species is now known from more than ten sites (the 17 specimens are derived from 11 sites) and has an extent of occurrence that now exceeds the IUCN (2001), criterion for vulnerable status, it may be more appropriate to treat the species as near threatened (NT) unless conversion of its habitat can be shown to have been 30 or more in the last 100 years. Cola mossambicensis is only likely to be confused with C. microcarpa, since they both have the young stems and petiole covered in a thick scurfy-felt like layer of red-brown hairs that is shed to reveal white stems, unusual features in East African members of the genus. However, they differ from each other in several floral and fruit features (see the key). In addition, C. mossambicensis is distinctive in that it is a tall tree with a fluted bole, and in that the white stems are conspicuously longitudinally grooved, with hair remnants showing darkly in the grooves. The leafy stems are particularly straight, stout and bear leaves at unusually regular intervals (1.5–2 cm) for a Cola. Moreover the petioles are very long, 10 cm being common. These features make the species determinable with some confidence even when sterile, which is not normally the case for simple-leaved Cola species. 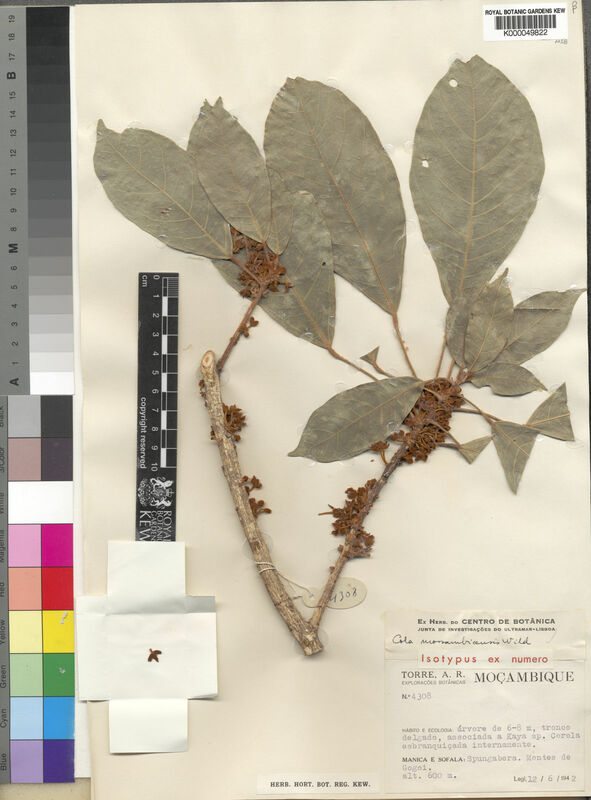 Specimens labelled C. microcarpa from T 4 (Kigoma District: Kasye Forest, buds 25 March 1994, Bidgood et al. 2962, ibid. fr. 2964; Mt Livandabe, y.fr.28 May 1997, Bidgood et al. 4152) may well represent C. mossambicensis since they have the distinctive characteristics referred to in the paragraph above. Their altitudinal range (850–1200 m) is also seen in the material of the species from Malawi. However flowering material is needed to confirm this identification. The limited fruiting material (only 3 mericarps are available) differs from C. mossambicensis in being more sparsely hairy than usual, and in lacking a rostrum and ridges, so it is also possible that this represents yet another new taxon for the area. Mkupete (Kimwera), timber, fide Semsei 733. Palgrave, Trees of Southern Africa: 599 (1977).